Made my third visit to Harrod's in Knightsbridge today... but I noticed a crowd of people taking photos, even though the security guads were saying not to... what were they doing?? They were taking photos of the candle lit shrine to Dodi Al Fayed and Princess Diana. 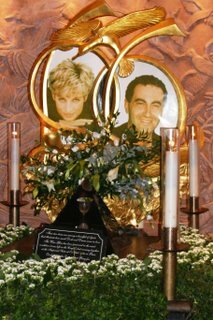 "On the lower ground floor of Harrods, at the base of Bill Mitchell’s spectacular Egyptian escalator, there is a quiet, candle lit shrine to Dodi and Princess Diana. This memorial was constructed in 1998 with the original intention that it would remain in the store for two weeks only. It is still there to this day due to the vast numbers of people wishing to remember and express their own feelings about the tragedy of Dodi and Diana’s end. To reflect the happy days of the couple’s last holiday together, their portraits are set amidst sculptured seagulls and Mediterranean plants and leafage. A fountain supports the images, with its endless flow of water symbolising eternal life. The interlinked ‘D’ photo frames illustrate the powerful harmony of this romantic connection. Four candles burn steadily, adding a sense of peacefulness and the passing of time. “The wine glass has been preserved in the exact condition it was left on the couple’s last evening together at the Imperial Suite at the Hotel Ritz in Paris. Dodi bought this engagement ring for Diana on the day before the tragedy”. Above the memorial itself, in the carved walls of the Egyptian escalators on the third floor, is Dodi’s handprint set in stone. It was the summer of 1997 and Bill Mitchell was finishing his Egyptian escalator masterpiece, when he suggested to Mr. Al Fayed that it may be possible to have all of the family set their hands in the wet cement. Dodi came with the family to do so. Ten days later, Dodi was dead, whilst the imprint of his hand remains, reminding the world of the shock-felt loss of his life. " Like the official record says, it is till very popular.